Ghost Brigade – IV-One with the Storm – Season of Mist – Out Now. It’s been a while since Ghost Brigade’s last offering of doom and gloom “Until Fear No Longer Defines Us” was released in 2011. In the meantime they’ve had a change of bass players as well as adding a fulltime keyboard player to their line-up. Now they’ve released their fourth album, just near the end of 2014. Melancholic, downtrodden and sadness are just a few words that come to mind when listening to this album and every single one of them is meant in the most positive way possible. The days are getting shorter, the nights longer and colder and this album couldn’t have been released at a more appropriate time. The heavier parts really hit that sweet spot of the more melodic infused doom metal, while also having a very catchy doom rock sound to it here and there to keep it on a faster tempo than the classic doom. It’s not just heavy music though; there are a lot of softer parts on the album which have a very nice vibe of loneliness. One of the things that really stars in these softer parts is Manne Ikonen’s singing which has become a lot better in the years between releases. While they were already good on the previous album, his clean vocals really hit that sweet spot even more on this one. There’s a lot calmer to his voice and a lot less strain. 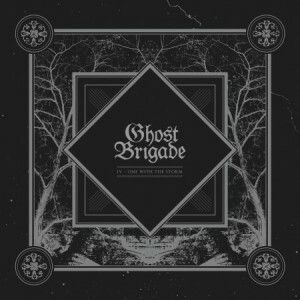 This album shows the different faces of Ghost Brigade quite well and it’s clear that they wear each face perfectly. While not as heavy as the big doom metal releases there certainly is a lot of good stuff to be found for those who wish to float alongside the darker side of music. Definitely an album to check out!